Hello and welcome to the 692nd installment of the SWD. Vehicle-borne improvised explosive device wounded three civilians near the main market in the city of Al-Bab in northern Aleppo. Turkey-backed Free Syrian Army (Al-Jaysh al-Watani al-Suri (Syrian National Army)) foiled a vehicle-borne improvised explosive attack on the city of Jarabulus, by arresting the perpetrator in the village of Al-Tukhar, after receiving information about a possible attack in the region. The perpetrator reportedly confessed to working with two individuals in the city, after being interrogated. Free Syrian Army arrested the two individuals and found improvised explosive devices and detonars. Free Syrian Army also claimed that the perpetrator stated that they would receive $2000 from Yekîneyên Parastina Gel (People’s Protection Units) after completing the operation. Unknown gunmen killed a civilian near Ali Amin school in the city of Salamiyah. Syrian Arab Red Crescent, in cooperation with the United Nations delivered a humanitarian aid convoy consisting of 133 trucks to Al-Rukban refugee camp on the border between Syria and Jordan. Guerilla group calling itself “Al-Muqawama al-Shabiya” (Popular Resistance) took responsibility for the yesterday’s explosion targeting a Syrian Arab Army’s checkpoint between Nimr and Al-Hara. Libyan National Army sent a large military convoy from Benghazi to Al-Jafra airbase. Libyan National Army deployed throughout the city of Awbari and assumed full control of the city and its institution without any clashes. 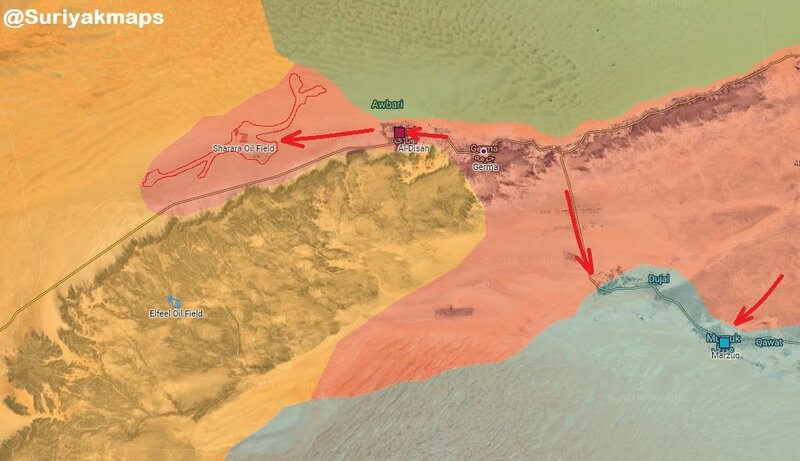 Libyan National Army took control of Al-Sharara field from armed groups and managed to secure it without any clashes. Afghan National Security Forces killed four and wounded seven elements of the Islamic Emirate of Afghanistan (Taliban) in Pul-e Khumri district. Islamic Emirate of Afghanistan overran an Afghan National Security Forces’ post in Haraz Khel area of Arghandab district. Islamic Emirate of Afghanistan’s Al-Emarah News claimed that 20 elements of the Afghan National Security Forces were killed and two armored personnel carriers destroyed in the encounter. Afghan National Security Forces killed four elements of the Islamic Emirate of Afghanistan and destroyed a vehicle in Marjah and Jerashk districts. Islamic Emirate of Afghanistan’s snipers killed three elements of the Afghan National Security Forces in Haidar Abad area of Jerashk district.